Just over ten months ago, we had a chance to take a look at a very big, reasonably impressive mobile workstation: HP's EliteBook 8740w. 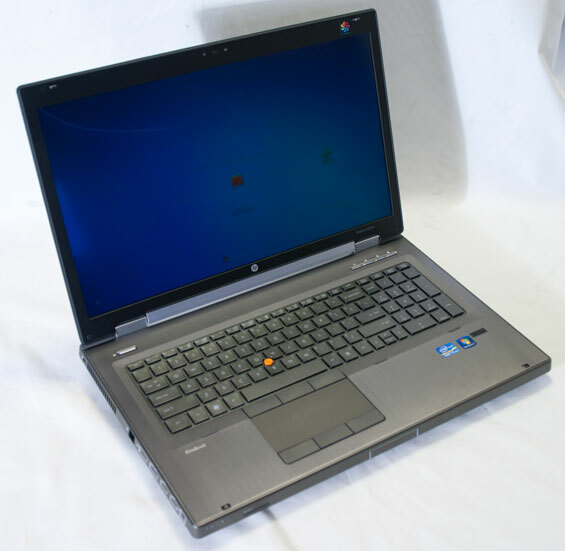 It sported HP's DreamColor IPS screen at a glorious 1920x1200 resolution and had fairly beefy hardware under the hood, including the at-the-time fastest mobile workstation GPU, the NVIDIA Quadro 5000M. But since HP unveiled the dramatic redesign of their enterprise notebooks earlier this year, we've been anxiously anticipating the 8740w's refresh. Today we have it, specced to kill with a shiny new DreamColor IPS screen, Sandy Bridge quad-core processor, and an even faster NVIDIA Quadro GPU. I'll go ahead and get this out of the way right now before we even get into the nitty gritty: the chassis on the 8760w is a massive improvement on the 8740w's schizophrenic aesthetic, but there's a cost that some of you aren't going to be willing to pay, and I'm not talking a monetary one. You may have noticed that all of HP's new business-class notebooks feature 16:9-aspect panels instead of the old standby 16:10, and the 8760w hasn't been spared. I personally don't have a huge problem with it, but it's hard to deny something's been lost here. Where consumer notebooks have potentially benefitted from the move to 16:9 (1280x800 to 1366x768 is basically a wash, while 17" notebooks got a boost from 1440x900 to 1600x900), the change from a 1920x1200 panel to a 1920x1080 panel is a loss; end of conversation. With all that said, hopefully the move to Sandy Bridge and access to the new GF110-based Quadro will make the transition a little less painful. Thus far we've only really seen the i7-2820QM in the Sandy Bridge review notebook we received way back when Sandy Bridge was first launched, so the EliteBook 8760w is at least going to be our first experience with it "in the field" so to speak. It's a pretty beefy CPU, too, with a 2.3GHz nominal clock speed that turbos up to 3.1GHz on all four cores or a very healthy 3.4GHz on just one. That actually puts it within spitting distance of desktop Sandy Bridge quads, and it's a testament to the power efficiency of Intel's architecture. HP has also seen fit to grant it access to four memory slots and our review unit is specced with 16GB of non-ECC DDR3-1333. The NVIDIA Quadro 5010M is a much more incremental update to its predecessor than the GeForce GTX 485M was to the 480M, though I suspect NVIDIA opted to continue using GF1x0 for their top shelf mobile workstation GPU due to its superior HPC capabilities. With the move to GF110, the 5010M now benefits from 384 CUDA cores instead of the 320 found on the previous generation Quadro 5000M, as well as bumps in clock speed to 450MHz on the core, 900MHz on the shaders, and 2.6GHz on the GDDR5. Gamers will undoubtedly be disappointed at the low clocks across the board, but the 5010M isn't really for them. While GF1x4 is more friendly for high-end mobile gaming hardware, GF1x0 likely remains the better choice for workstation tasks. Our review unit is also bolstered by Intel's QM67 chipset, allowing for RAID 0/1/5 support as the EliteBook 8760w can support two 2.5" drives natively and a third if the user chooses to swap out the optical drive for another drive bay. As befitting a workstation notebook of this caliber, there's also virtually every type of connectivity the end user could ask for: eSATA, USB 2.0, USB 3.0, FireWire, Bluetooth, and even ExpressCard/54 are all present. In the future could you actually make a point of informing users about the fan (A bit more info)? Does it stay on all the time? Does it switch off as this is one of the more important aspects. Dell Vostro v131, celeron, fan ALWAYS off! The BB09 along with the standard battery on a 6460b will play full screen media non-stop for 14+ hours (Wireless off, lowest brightness, audio via headphones). In my experience, the fan starts spinning on high usage like rendering or hd editing. It spins sometimes in photoshop but for short periods while in illustrator it stays off all the time (cs5.5). It also spins up but on lower rpm when i'm using both external and laptop display and it stays on all the time. If I'm using "projector" only or the laptop display only, it stays off. Standard temperature (CPU) is around 45°C, the maximum I got it to go is up to 80°C but still the keyboard and the part around the power button never gets hot, just warm. I'm aware of this. The entire new Elitebook and Probook range are thicker than nearly any laptop I've used in the last 5 years YET the fan is always on even after updating the bios which enabled the 'fan' option. That said same option no longer even does what we think it does. I too bought an 8740w just for the x1200 dreamcolor. Had it been 1080p I wouldn't have bothered. I sure hope this notebook lasts me until monitors finally start picking up resolution. This convergence to 1080p and nothing higher gives me the creeps. Thanks for pointing out that fact in this review. Well, mostly because the upgrade also includes the price of the base display (probably around 150-200$) and because you get much better back-lighting for desktop screens. Additionally, size does matter, there's a bunch more material costs, more/better control circuits, a power supply, a foot, and finally dream color is just a brand - so the panel is probably utterly dissimilar from that used in the desktop. Also, the desktop screen market is a much more competitive market, as you can plug any screen into any computer - with the laptop you're limited to the options your producer gives you. If you compare the dream color offering to NEC and eizo offerings, you will see that it is priced for a certain market.